The Chief and Band Council have asked us for our input as they work through a consultation process that is focusing on what should be done to improve management and operations of Sauble Park. 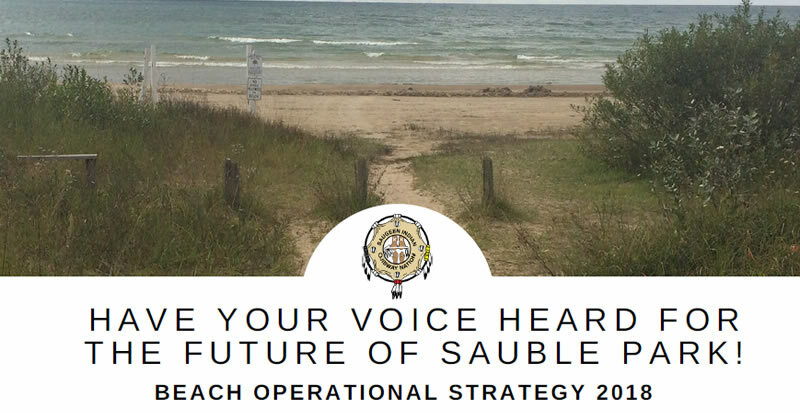 The Band has hired Canadian Ecotourism Services (CES) to assist them in developing an updated Operational Strategy for Sauble Park including the feasibility of various options associated with banning cars from the Beach. CES has been asking Band members and others to participate in an on-line survey as one means of getting input to the their study. This week they have posted a version of the survey with a series of questions for cottage owners and are asking cottage owners to participate as well. The attached Consultation Poster includes a URL that leads to the survey. When you sign on to the survey you will come to a page that asks for your name, lot number (not your fire number), phone # and e-mail address etc. They will use this to capture cottage owner responses and can then differentiate those from responses from Band members and other stakeholders who choose to provide input. We see this as a great opportunity for individual cottage owners to have a say directly. We encourage you to take the time to complete the survey. Some of you will have a lot more experience with the Beach because you are close to the action while others may think they are too removed to have much to say. However, everyone’s input will be important, so please participate whether you have had exposure to the beach in recent years or not. The Band and the consultants have made it clear they want input that focuses on the Main Beach. However, the survey does have places where you can comment more generally on things you would like to see changed/improved. Please keep in mind that French Bay Beach and French Bay Cove Beach are technically not part of Sauble Park but are subject to Sauble Park Policy and Rules. Banning cars from the Main Beach is a primary reason for this study and the impact of doing this will be far reaching, particularly when you consider alternative parking and traffic patterns (vehicular and pedestrian). The Survey will be taken down off the web on December 7th. We are so impressed with the positive direction the Chief and Band are taking. Getting cars off the beach would be so good ! We swim at French Bay but walk the beach at Sauble Park. We are pleased by the quick raking of the beach in the Spring. The cars never interfere with our walk, and the dividing mound works. The Band can’t do much about the irresponsible litterbugs. that we have with the Chief and band council. to our Saugeen friends and thanks for the excellent service.